As a dietary supplement, take one 120mg Gotu Kola tablet 2-3 times daily. What are Gotu Kola Enteric Coated Tablets? Our Gotu Kola Extract tablets, besides being very high in bioactive compounds, have another special trick up their sleeve; enteric coating. Enteric coatings are designed to resist stomach acid, only releasing their contents once they have passed the harsh acidic environment of our stomach. For many supplements, this is completely unnecessary, as they fare perfectly fine in stomach acid and absorb well in the stomach too. This is not the case for something like a Gotu Kola supplement, as the triterpenes contained in Gotu Kola break down in our stomach acid. This actually is not necessarily a bad thing, as the breakdown products of these triterpenes still have important physiological effects in the body. However, by enteric coating Gotu Kola, we can selectively induce different effects than regular Gotu Kola supplementation. 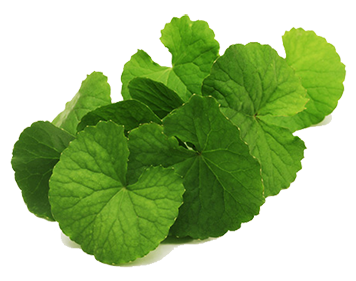 The triterpenes contained in Gotu Kola, which have a glucose moiety are especially sensitive to our stomach acid. The glycoside triterpenes asiaticoside and madecassoside, quickly lose their glucose moiety when exposed to stomach acid and turn into their aglycone counter parts, asiatic acid and madecassic acid. This is a shame, as asiaticoside and madecassoside both have their own unique effects, such as enhancing brain derived neurotrophic factor (BDNF) levels and can help promote healthy cardiovascular function. This is one of the main reasons why we decided to create enteric coated tablets of our Gotu Kola extract. Another reason why we decided on enteric coated tablets is, in theory, enteric coating our Gotu Kola extract, may also increase the duration of effects. This is due to the fact that asiaticoside and madecassoside will eventually metabolize into asiatic acid and madecassic acid, which are both also bioactive compounds. Instead of having asiaticoside and madecassoside rapidly break down in the stomach to form asiatic acid and madecassic acid, the enteric coating allows the asiaticoside and madecassoside to fully absorb. This will allow asiaticoside and madecassoside to exert their beneficial effects in the body, before turning into asiatic acid and madecassic acid, and allowing them to exert their beneficial effects. Our enteric coated tablets are made with methyl cellulose; an inert, safe and hypoallergenic ingredient. Methyl cellulose is hydrophobic, meaning it is “scared of water”, this is one of the reasons why it is able to resist the harsh environments in our stomach. Once the enteric coated tablets have passed our stomach, the enteric coating will slowly start to fall off, allowing the Gotu Kola tablets to release their contents. This same technology has been applied to other sensitive ingredients such as probiotics. Enteric coated probiotics have been shown to work much better than regular probiotics. This is because enteric coated probiotics deliver probiotics where they are needed most. The same technology has been applied to fish oil because enteric coated fish oil can prevent fish oil burps. As a dietary supplement, take one 120mg Gotu Kola tablets 2-3 times daily. Nootropics Depot offers 90 count or 180 count jars of high quality Gotu Kola Extract Tablets. Nootropics Depot's Gotu Kola Extract (Centella asiatica) has been lab-tested and verified for both product purity and identity.